Drive-out approximately 30 miles (48 km) to the embarkation point of your airboat from your New Orleans hotel. 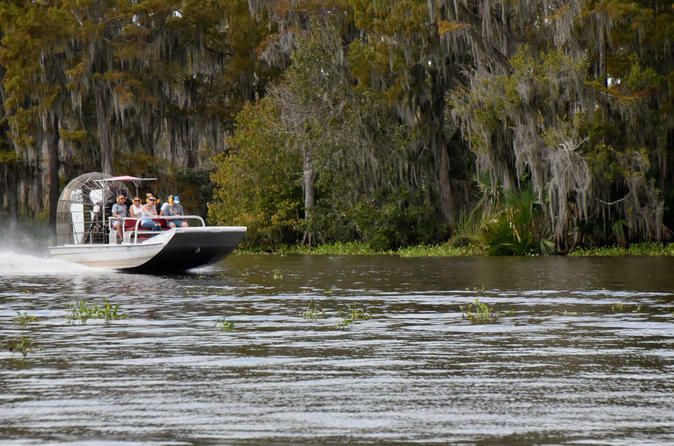 Depending on the option you selected, board a large airboat holding 15 to 25 passengers or a small airboat limited to six to eight passengers for a more intimate, personalized experience. Your morning or afternoon airboat tour ends at the embarkation point. Be sure to check out the indoor exhibits of alligators — including an albino alligator — before making your way back to downtown New Orleans on your own. Note: This tour does not include hotel pick-up or drop-off unless hotel pickup and drop-off is selected at checkout. If you have selected hotel pickup and drop-off please specify your hotel details in the 'special requirements' field at the time of checkout or advise the local operator directly after booking.